The village of Comberton is about 6 miles from the historic university city of Cambridge, in the East Anglia region of England. It has a population of about 2000. It lies less than a kilometer from the Greenwich Meridian, so its Lat/Long is roughly 52°N, 0°E (more precisely it is 52°12'N, 0°01'N). The National Grid Reference for the crossroads in the centre of the village is TL382563, at an altitude of 29m. See the village web site for more information. See a bigger location map showing where it is in the UK. 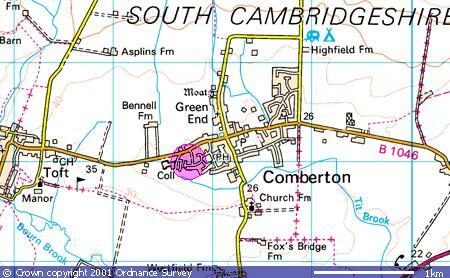 For a full map of the village of Comberton, here is a 'free for non-commercial use' village map. It is copyright (c) Paul Hardy, March 2001, revised to July 2015. The village is to the South West of the city of Cambridge, as shown in this approach map (Crown Copyright), courtesy of the Ordnance Survey's 'Getamap' service. 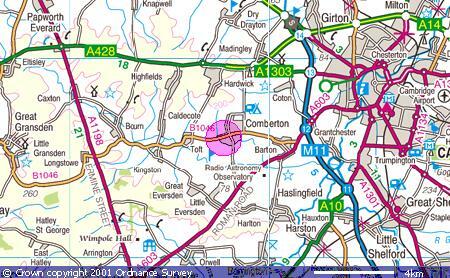 Our bungalow is at the western side of the village, on the southern edge, as shown on this further Crown Copyright map. Here are directions for approaching the village and finding our house. Here is plan of the centre of the village itself showing our house. Here also is an A4-sized "Knowhere Map" in Adobe PDF, showing three submaps of increasing detail of how to find our house. 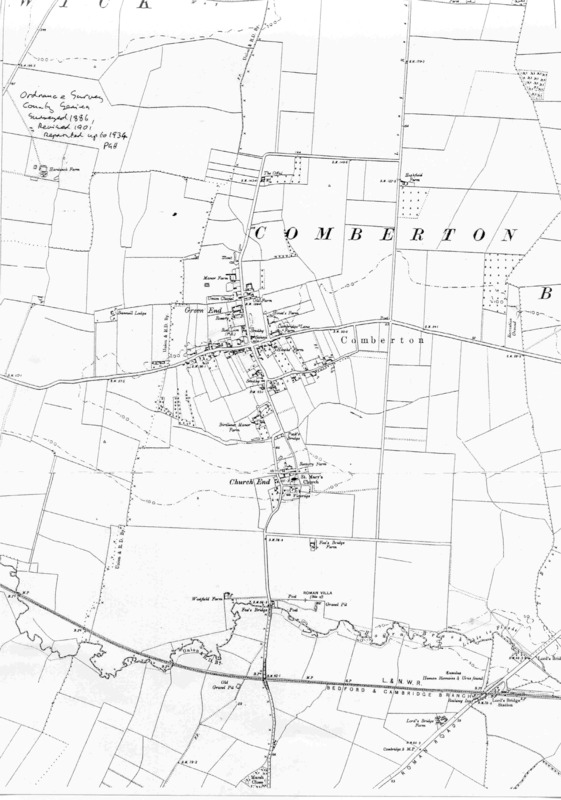 Finally, a historical OS map of the village of Comberton, surveyed in 1886, revised 1901, and reprinted up to 1934. Comberton is twinned with the village of Le Vaudreuil near Rouen in France. 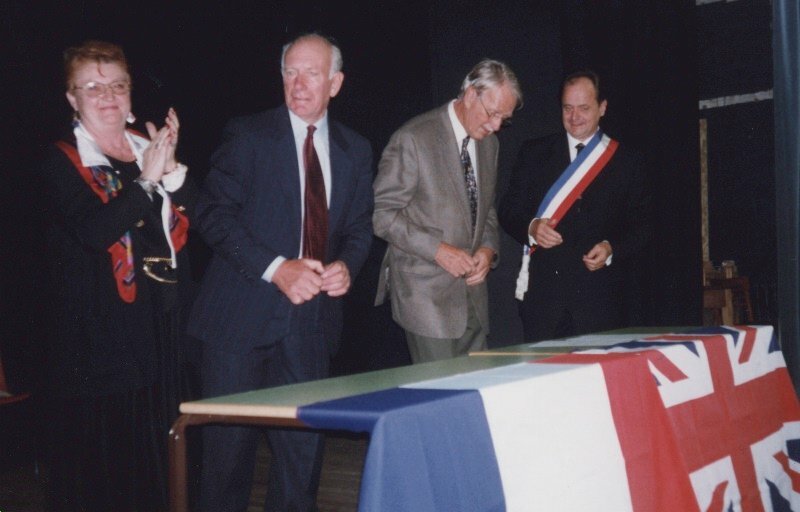 A twinning ceremony was held in Comberton on the 18th September 1999, and a reciprocal visit was made in May 2000, with visits twice a year since. If you need even more detail, then this is a higher resolution scan of the Twinning Charter, suitable for A4 printing.